About Mbamigi Mbamigi is an isolating language inspired by Polynesian (especially Hawaiian) and Bantu (especially Swahili) languages. Mbamigi has two writing systems. One is a vertical alphabet, Gaan Eibo, which was inspired by Devanagari turned on its side, the other is a horizontal syllabary, Gaan Geugeu, was inspired by the Thai alphabet. 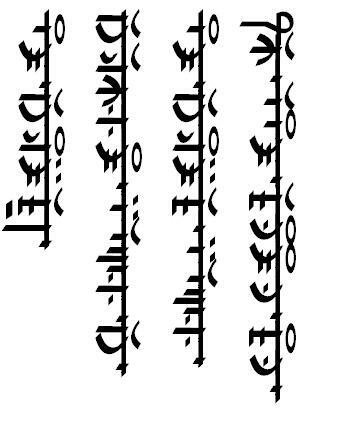 In universe, Gaan Geugeu is a native writing system which was later replaced by Gaan Eibo, the writing system of the Kingdom of Dhwer, which was their overlords for many centuries. Since independence, Gaan Geugeu has been gradually reintroduced by government mandates. Mbamigi has also recently started using Dulic. The following is a translation of "Enough is enough! I have had it with these motherfucking snakes on this motherfucking plane!". ɂa aem g̃alemel g̃el em zagemug̃a uado zagaɂome uado za em zagemug̃a! ha aem kalemel kel em sagemuka uado sagahome uado sa em sagemuka! Sample of Mbamigi[view] Nye hon olyom Vaamekos. Below is the orthography for Mbamigi. This includes all graphemes as defined in the language's phonology settings - excluding the non-distinct graphemes/polygraphs.